This first volume is applicable to a wide audience, from students at the graduate level, to experienced researchers and laboratory personnel in academia, industry and government. This volume also available as part of a 4-volume set, ISBN 0444519599. Discount price for set purchase. Chapter 1. Sampling of sediment and suspended matter (A. Parker et al.). Chapter 3. Chemical analysis of contaminants in sediments (M. Petrovic et al.). Chapter 4. Biological analysis (bioassays, biomarkers, biosensors) (P.-D. Hansen et al.). Chapter 5. Effect directed analysis and toxicity identification evaluation (J.F. Bakker et al.). Chapter 7. Modelling of pollutant fate and behaviour in bed sediments (I.J. Allan, J.A. Stegemann). Chapter 8. Sediment quality guidelines and weight of evidence assessments (M.D. Scrimshaw et al.). Chapter 9. 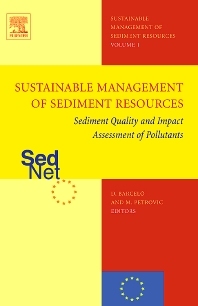 Soil protection, sediment monitoring and key recommendations (D. Barcelo, M. Petrovic). Prof. dr. Barcelo Damia, Director of the Catalan Institute for Water Research (ICRA) and Professor at the Institute of Environmental Assessment and Water Research (IDAEA), Barcelona, Spain. His expertise is in water quality assessment and management, fate, risk and removal of emerging contaminants in wastewater treatment plants and analysis, fate and risk of emerging contaminants and nanomaterials in the aquatic environment. He published over 900 papers, 200 book chapters and has h index 91. He was a coordinator of several national and EU projects and at the moment he coordinates two EU projects: GLOBAQUA , on multiple stressors in the aquatic environment and SEA-on-a-CHIP, on the development of sensor technolgies for emerging contamaints in marine aquaculture. He is CoEditor in Chief of the journal Science of Total Environment and the book series Comprehensive Analytical Chemistry, both form Elsevier..